Defense Minister Ehud Barak on Sunday expressed deep misgivings about upcoming talks between Iran and the so-called P5+1, and the efficacy of sanctions on Tehran. "It is clear that the depths of the sanctions is different from what we had in the past, and it has its impact both the closing of the SWIFT clearing system as well as the sanctions on the oil export and, of course, the coming negotiations that will probably encourage them to move," Barak told CNN's Fareed Zakaria during a lengthy interview. "But to tell the truth, we hope for the better, but I don't believe that this amount of sanctions and pressure will bring the Iranian leadership to the conclusion that they have to stop their nuclear military program," he added. During the interview Barak told Zakaria in no uncertain terms what Iran would have to agree to in order to avert an Israeli strike on its nuclear facilities. "We are not against any kind of effective and urgent sanctions, not even against negotiations. But we told our American friends as well as the Europeans that we would have expected the threshold for successful negotiation to be clear, namely that the P5+1 will demand clearly that, number one, no more enrichment to 20 percent," Barak said. "All the already enriched 20 percent material out of the country to a neighboring trusted country. Then all the material enriched to 3.5 percent, probably except for a few hundred kilograms, should be taken out of the country, once again, into a neighboring trusted country. "Number three, the installation in Fordo near Qom under the ground should be decommissioned in order not to enable them to resume enrichment to 20 percent, and tight inspection by the IAEA, according to protocol 3.1, should be imposed. "If all these are met, even if they get in exchange fuel rods for their TLR, their research reactor and so on, that could be OK. 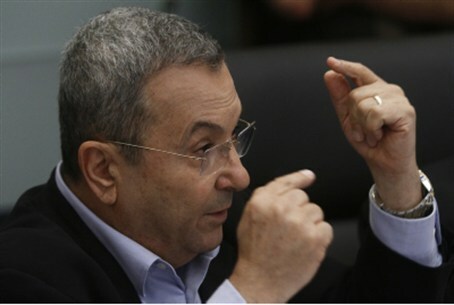 It would be a different regime," Barak explained. However, Barak was also clear that Iran's current proposal of merely halting the enrichment of uranium to 20% would be unacceptable to Israel. "But if the P5+1 will settle for a much lower threshold, like just stop enriching 20 percent, it means that basically the Iranians, at a very cheap cost, bought their way into continuing their military program, slightly slower, but without sanctions. That will be a total change of direction for the world. "I really see it as a major change for the whole world. I really see it as a critical time for the rest of the world as well. And I really think that the tightest possible sanctions and steps against Iran should be ratcheting in a way that will effectively corner it," Barak said. Later, Barak concluded the interview saying Israel was in a unique and dangerous position on the world stage, and stood with a sword in one hand and an olive branch in the other. "We realize we are living in a tough neighborhood, no mercy for the weak and no second opportunity for those who cannot defend themselves. We want to be strong, ready to protect ourselves, under whatever kind of threat, but at the same time, stretching out our hand to make peace with any neighbor who is ready for it," Barak said.